Jackson Pollock; to Sanford McCoy; by descent to Family of Sanford McCoy; Margrit Ramme, by November 4, 1971; Private collection, U.S.A.; David Tunick, Inc., New York, summer 2000; purchased by NGA, 2001. Jackson Pollock: Blind Spots, Tate Liverpool, Liverpool; Dallas Museum of Art, Dallas, 2015 - 2016, unnumbered catalogue. O'Connor, Francis Valentine and Eugene Victor Thaw, editors. Jackson Pollock: A Catalogue Raisonne of Paintings, Drawings, and Other Works. 4 vols. New Haven and London: Yale University Press, 1978. Williams, Reba and Dave Williams. 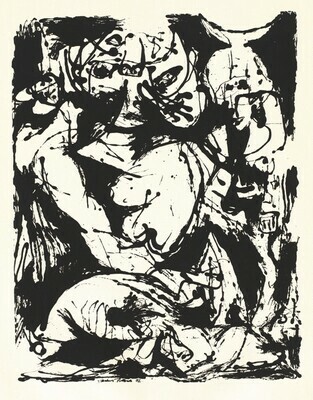 "The Prints of Jackson Pollock." Print Quarterly. Vol. V, no. 4, (1988): 347-273. Jackson Pollock: Blind Spots. Exh. cat. Tate Liverpool; Dallas Museum of Art, 2015.